Every Studio may invoice their costumes differently. Please read through the options outlined below. If you need to discuss your specific procedures please contact us. *You do not have to invoice for deposits. If they are not required, you can just put any costume deposit money in the View/Add Parent Deposit with a note it is for costumes. Then when you invoice for costumes, apply the deposits. 1. You must set the Income Category Price that will be charged in Billing-Income Category Price tab. 3. In the top section, select the category to be charged. Costume Deposit. The line will change color. 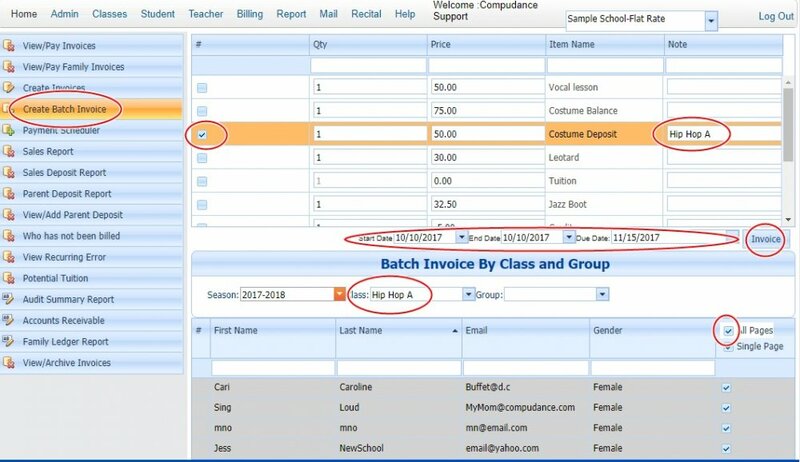 You may add a note, we suggest the class name or style to make it easier if a student takes more than 1 class and is asked for multiple deposits. 4. Go to the bottom of the page. Use the Class Filter and select the class to be charged. THe students listed will only be the students actively enrolled in that class. Select All pages. These are the students receiving the charge. 5. In the middle of the page, enter the 3 dates. Since a deposit is more of a transaction request you can use today’s date for the start and end dates. Set the due date to when they are due. 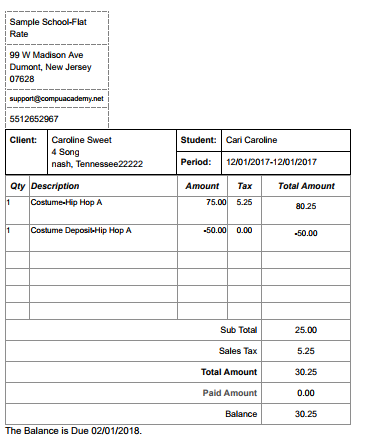 If you collect taxes on Costumes you must invoice the full price of the costume to have the tax amount calculate correctly. When invoicing, you would also select the costume deposit as a negative being applied. If you do not collect taxes on Costumes, you may just invoice the Costume Balance still owed per class. *Do not worry if a Deposit was not paid, that original invoice will still be OPEN with a balance and show on the Statement for payment. p(banner tip). You can send out Costume Statements to include all of the costumes on 1 email/print out for that student/family. You may need to invoice something per family. 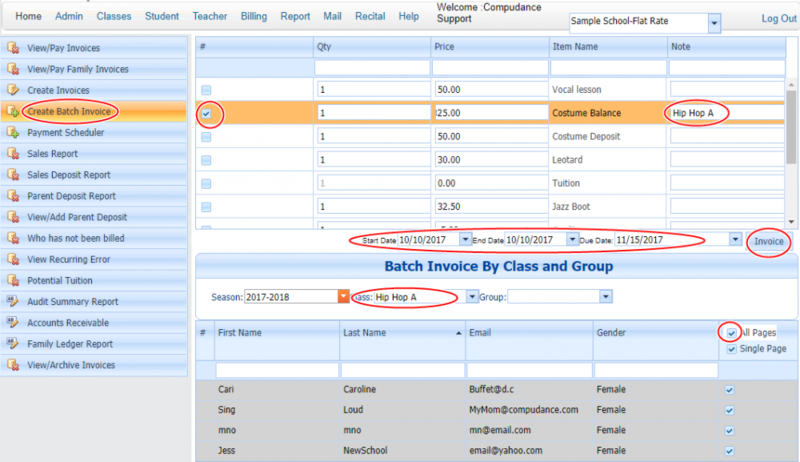 We find the easiest way to do this is to batch invoice. In the bottom area, sort the student list by email address. Then check off each distinct email address. This may not work for your studio based on how you keep email addresses. Some studios will create a School Group called First Student in Family. Then add 1 sibling to this group. 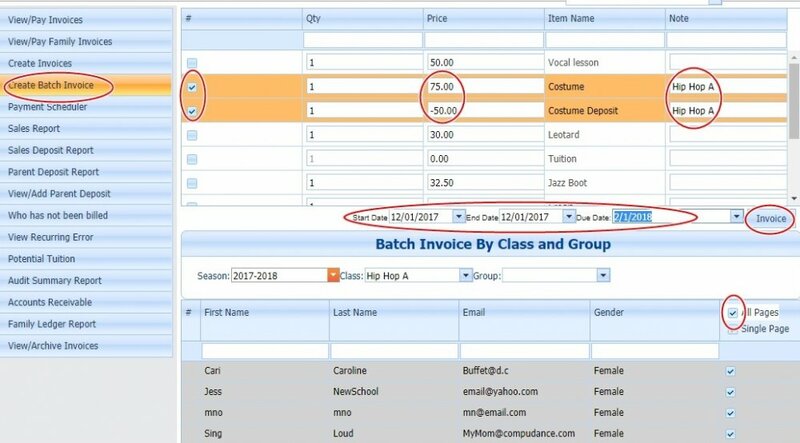 That way you can batch invoice filtering the student list by Group. We are working on changing this process in the future.